Have you eaten dates before? This was another first for my family as we received an entire box of fresh Medjool dates from the Agritopia Farm in our Chow Share box for this week. I love that the dates were grown less than 20 miles from my house. When I heard that we would have farm fresh dates in the basket, my first thought was simply how fun it would be to try another new food. 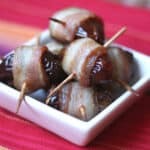 I’d recently seen some photos of Bacon Wrapped Dates on Pinterest and I couldn’t wait to try something like that. 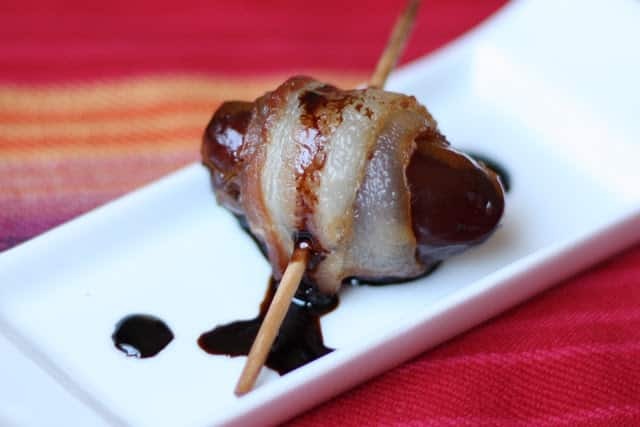 What fruit or vegetable doesn’t become even more delicious when wrapped in bacon? The dates were incredibly sweet and the salty bacon provided a great balance to each bite. Because I didn’t want to leave it at that, I reduced some balsamic and drizzled it that over them. I loved the combination of the three best of all. My husband liked them best without the balsamic though. Surprising me most of all, my kids went nuts over these. Both of my older boys thought they were eating candy. Preheat oven to 425 degrees. Line a baking tray with foil and set aside. Using a sharp knife, slit the side of each date and remove the pit. 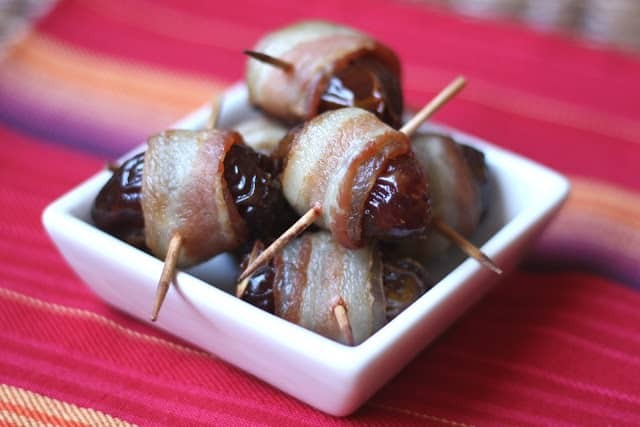 Wrap each date in bacon and then stab completely through with a toothpick to hold the bacon in place. (If you don't use a toothpick, the bacon will shrink and slide off of the date as it cooks.) Place wrapped dates on the foil lined sheet. Bake for 12-15 minutes, until the bacon is cooked through and slightly crispy. While the dates are in the oven, pour some balsamic in the bottom of a small saucepan. Turn the heat to medium low and bring to a slow simmer. 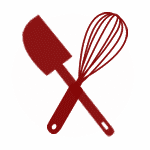 When the vinegar has reduced by about half, remove from the heat and drizzle over the finished dates. Enjoy! Wow...now you are getting dates in your share? That is awesome! I love dates and I sometimes pop one before I work out. They give you great energy. This is a great way to serve them up - the salty/smoky/sweet combo works for me! These look so delicious, we make them wrapped in prosciutto, and I agree with your boys, they are like eating candy! We used to get Date Shakes on the way to Palm Springs when we lived in California, they were amazing...you should try putting dates in some of your smoothies! very delicius.....I love dates and bacon. These popped up on the BBQ forum, people were smoking them. Thank god I'm allergic to pork. I'm not sure I'd be able to control myself otherwise! I never would have thought to try that. I bet it was wonderful! I've tried a similar recipe without the balsamic reduction, and it was awesome. This would definitely be worth a try! The combination of sweet and savory in this is making my mouth water like crazy. Love this classic. Have never tasted dates but love the idea of sweet and savory. I love balsamic vinegar though. OOOOhhhh! This looks so Yum! I just got some dates (and I always have bacon). I think I'll stuff these with honeyed goat cheese and have them as part of the snack buffet for Grammy night. Great inspiration my freind! I made these last night for a cocktail party and a hit!!!!! One said..."they taste like breakfast mmmmmm" I would definitely make again!